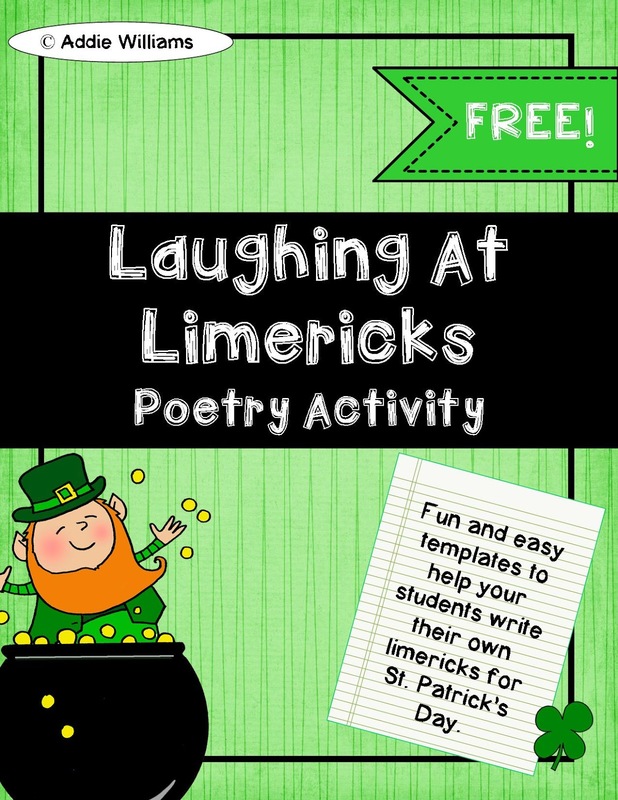 Laughing At Limericks - FREE Limerick Writing Activity! Top o'the day to you all! It's March and I'm tenuously holding on to some small Irish heritage as an excuse to celebrate St. Patrick's Day. I don't spend a lot of time on holiday related writing, but when I can, I do incorporate it into our day. Limericks are fun and silly and appeal to just about every grade level. I know that my Grade 8s have had a blast with these in the past... their imaginations and sense of humour are awesome! However, I also know that some of them have struggled to come up with a limerick of their own and I've heard the familiar whine... "I don't know what to write about..." too many times! So I created a set of "recipes" to help students write their own limericks. They're easy to use and appeal to a wide range of ages and abilities. Have fun and let the silliness begin! Click on the image below to download your FREE copy. Check out more fabulous FREEBIES at The Cornerstone for Teachers Blog! This FREEBIE as well as several others was featured there for the month of March. Oh, Limericks! I do them with my third graders every year. They aren't always perfect, but everyone has fun trying. I love your download! Thanks Christi! I hope you and your third graders have fun. Five months ago this award was created to encourage teachers who blog. Since that time, there have been MANY new bloggers who deserve some high fives from the blogging community. Wow!! Thanks so much Debra! I just awarded you with the Liebster Award for your blog!! Thanks for sharing your ideas! Come see my blog that has the information on it so you can pass it along! Awesome - thanks JD! I'll get to nominating some others this weekend!